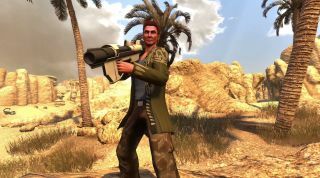 UPDATE (9/14/12): Funcom pushed back Issue #2's release to next week in order to iron out lingering "severe exploits." We presume this also means a chance for added lensflare effects on your rocket's backblast. Why? Because rocket launcher , that's why. ORIGINAL: Unraveling the mysteries of The Secret World demands subtlety, deception, cleverness, and a wardrobe of perfectly pressed clothing. That's why Funcom's inclusion of a rocket launcher to its Dig Deeper Issue #2 update releasing tomorrow seems slightly odd, unless we're meant to crack conspiracies open in the literal sense -- but hey: rocket launcher . Lead Content Designer Joel Bylos' narration of the video reveals an entire questline requirement for acquiring your new heavy ordnance. "Several new missions" such as investigations and lair actions also appear in addition to an extra active and passive ability slot and Nightmare modes for the new Facility and Hell Eternal dungeons. Character customization expands with the opening of the pun-tastic Ockham's Razor barbershop in London and The Modern Prometheus plastic surgery clinic in New York featuring the most conspicuous doorway ever for a supposed "underground" facility. Dig Deeper originally had a September 11 release but met a brief delay after Funcom patched a " severe exploit ."